The Steiny Road Poet wants to introduce you to another Stein—Frankenstein. Like the adult Gertrude Stein who was nicknamed Baby Woojams, Mary Wollstonecraft Shelley’s Frankenstein was a big baby. When this creature was created by the young man Victor Frankenstein, he had no language skills and no knowledge of the world. So, hold on to this thought—in today’s political climate, we have two big scary babies as world leaders who have their fingers on nuclear weapons. 2018 marks the 200th anniversary of the publication of Shelley’s remarkable sci-fi novel that deals with many subjects including moral responsibility and education. 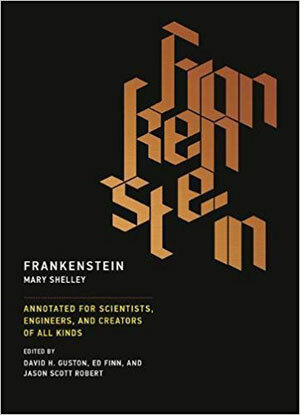 In advance of the big anniversary comes two more annotated editions of Frankenstein— Frankenstein or, The Modern Prometheus: Annotated for Scientists, Engineers, and Creators of All Kinds as edited by David H. Guston, Ed Finn and Jason Scott Robert and The New Annotated Frankenstein edited by Leslie S. Klinger. In 2009, a refereed scholarly website named Romantic Circles published a study aid on the number of editions of Mary Shelley’s Frankenstein. The list numbers 281 editions with a large portion of those editions being translations into various languages. A look at Amazon.com shows that since 2009 many more editions have been published or are forthcoming. A cursory look at Klinger’s edition seems to indicate a study of myth in our time and how the story was affected by biographical details of the author Mary Shelley who, like her monster, grew up without a mother and had a rough time with her father. However, Steiny chose the edition pointed to scientists and creators. The Guston-Finn-Robert edition deals head on with questions about contemporary issues like: who is responsible for the inventions of our day and how they are used. In his introduction to the science focused edition, Charles E. Robins calls this edition the STEAM edition because he puts the Arts into STEM (Science, Technology, Engineering, Mathematics) education. Just like misconceptions abound about how impossible reading Gertrude Stein’s work is, similarly Frankenstein suffers from fanciful negative projections. Steiny always thought that this monster (and that is the word of choice for those who never read Shelley’s story) was created by an old professor in a white coat and that somehow the monster escapes into the world not only terrorizing everyone but killing them too. In fact, the creature-turned-monster only kills people associated with Victor Frankenstein. The actual story of Frankenstein, which Mary Godwin (Godwin was Mary Shelley’s father’s surname) began writing when she was eighteen years old, involves a home-schooled young man named Victor Frankenstein who is sent to university where much to his surprise he learns all his scientific models are outdated. At first, he rejects this news but he finds a sympathetic professor who brings him into line and from there Victor works hard and obsessively charts a secret course for himself to create life from dead human and animal parts. When he succeeds, Victor freaks out and his creature wanders away to fend for itself. Here Steiny should mention that the creature is never named but it is considered a male. What’s interesting about Victor’s creature is that he is a vegetarian, eating nuts and berries, and he is able to learn how to speak, read, and operate in the world by observing a family who is living in isolation in a wooded area. He is also keenly interested in developing relationships with human beings so he won’t feel so lonely. Therefore, he gathers firewood each day for this family without revealing himself. He is surprisingly self-aware, knowing that his physical aspect is frightening. Thus, his first attempt to communicate his desire for friendship is with the blind grandfather of this family. Things go badly when the grandson comes home. Ultimately, the creature asks his father (Victor) to make him a female partner. The counter balance to the scary-looking but initially gentle creature is the handsome and cowardly Victor. In her essay “Frankenstein Reframed: Or, the Trouble with Prometheus,” Elizabeth Bear (one of the essayists of the Guston-Finn-Robert edition) thoroughly examines the character of Victor who is the stand in for the fire-stealing Prometheus. Bear says Victor doesn’t quite meet the standards of Prometheus who does humankind good by giving them fire stolen from the gods. She outlines why Victor is more the monster than his creature. She writes, “Victor really doesn’t think things through, which is an aspect of his monstrosity: the fatal flaws that result in his destruction are that incuriousness and that narcissism.” Does this sound like anyone we are bearing witness to on our political stage? Furthermore, Frankenstein is the ultimate word on insidious misogyny. Mellor says Frankenstein “explores what happens when a man attempts to have a baby without a woman.” The unattended, unloved child becomes a monster. Victor’s distrust of females becomes blatantly obvious when he tears apart the female version of his creature. Among his reasons for destroying this womanly creature is that he believed she could not be controlled by men, that she might have sadistic tendencies based on her unchecked sexual desires, that she might be deemed uglier than her male partner and therefore rejected, and that she would reproduce and bring more terror into the world. Here Steiny hints that Victor’s treatment of the women around him wasn’t democratic either. Victor might have had current day views like some Republicans, including our 45th president, about not allowing women to be in control of their bodies or the Chinese who, until recently, forbade more than one child per family which had an ill effect on female children who were either killed or sent to orphanages for foreign adoption. There are six thought-provoking essays, a chronology of science and Mary Wollstonecraft Shelley life ranging from 1745 (invention of the first capacitor, the Leyden Jar) to 1851 (death of Mary Shelley), a chapter-by-chapter compendium of discussion questions as well as an editor’s preface, an introduction by Charles E. Robinson, and Mary Shelley’s 1831 introduction to a new edition of her novel. One small criticism is that not all of the annotations to the text were necessary and Steiny felt that some of them were overly academic, interrupting the flow of the novel. Interestingly, the annotations were written by a congress of writers. Gertrude Stein, who was a trained research scientist at Harvard University, wrote about a science monster also—Dr. Faustus Lights the Lights. Like Frankenstein, Stein’s opera-ballet Dr. Faustus deals with electricity and a man who wanted to be better than an ordinary human being. Dr. Faustus, like Victor Frankenstein, was a monster. Frankenstein is a cautionary tale we are living today, given who is leading the United States and North Korea, two countries where the leaders in a fit of pique could blow up the world with nuclear bombs. Karren LaLonde Alenier's most recent book is The Steiny Road to Operadom: The Making of American Operas. She is a Senior Writer for Scene4. Scene4 (ISSN 1932-3603), published monthly by Scene4 Magazine–International Magazine of Arts and Culture. Copyright © 2000-2017 Aviar-Dka Ltd – Aviar Media Llc.